Students from OFMS and OFHS joined OFCS Superintendent Dr. Jim Lloyd this week for the first Superintendent-Student Advisory Council Meeting. 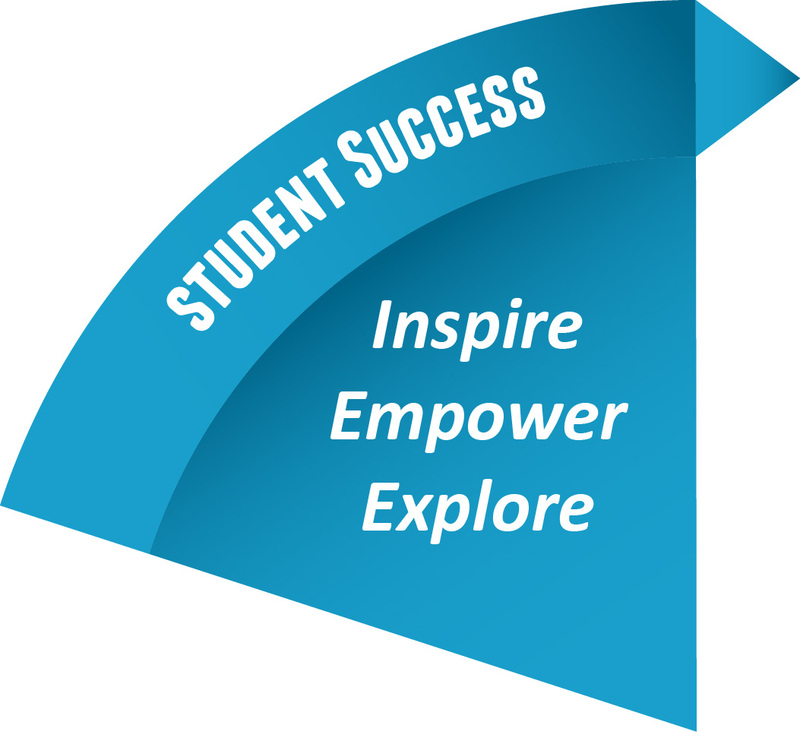 This newly formed group will serve as a forum for a more amplified student voice to provide direct input and feedback about the school district. Participating students in grades 6-12 were nominated by their building principals. Student members from OFHS include: Lindsey LaPinta, Sean Dougher, Kaitlyn Linder, Neil Spooner, Trae Henderson, Ruthie Ortega, Kyle Sinclair and Mae Alhashash. Student members from OFMS include: Leah Kerber, Luke Ventimiglia, Josh Gonzalez, Claire Schultz, Emerson Long and Katie Voisinet. Thank you to each of these students for their time, input and participation. The group will meet approximately four times during the school year. Great show! 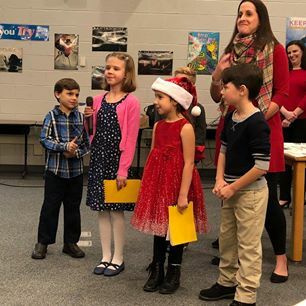 Congratulations to our Falls-Lenox 2nd graders on a fantastic concert performance this week! Our young students performed a collection of American Patriotic Folk Songs in front of a full house at the Olmsted Falls High School Auditorium. All were dressed in red, white and blue to perfectly fit the patriotic theme of their program. They looked great and sounded great on the big stage! Well done Bulldogs! Congratulations to OFHS student Cole Zehe who was part of a team that placed first in a local technology competition. He and students from Brunswick High School and Tiffin University were part of a mixed team that competed last month in the Hyland Hackathon, a competition where students use technology to create an impactful product. Cole’s placed first in the college category! His winning team even beat a team of data science grad students from Mercyhurst University. To view a media story about the program and the team’s win, click HERE. The Olmsted Falls High School PTA’s 31st annual talent show is in the Olmsted Falls High School Auditorium this Saturday, January 27th at 7 pm. This scholarship fundraiser will feature about 25 local students in grades K-12 performing a myriad of talents including: singing, dancing, and playing various instruments. New this year, is a number featuring the entire cast! Also new this year, members of the Golden Bullettes Drill Team will teach a dance number to preschoolers before the show starting at 6pm, and they will preform at the beginning of the second act. If you are interested in the preschool program, please see Dance With the Golden Bullettes at the OFHS PTA Talent Show for details. 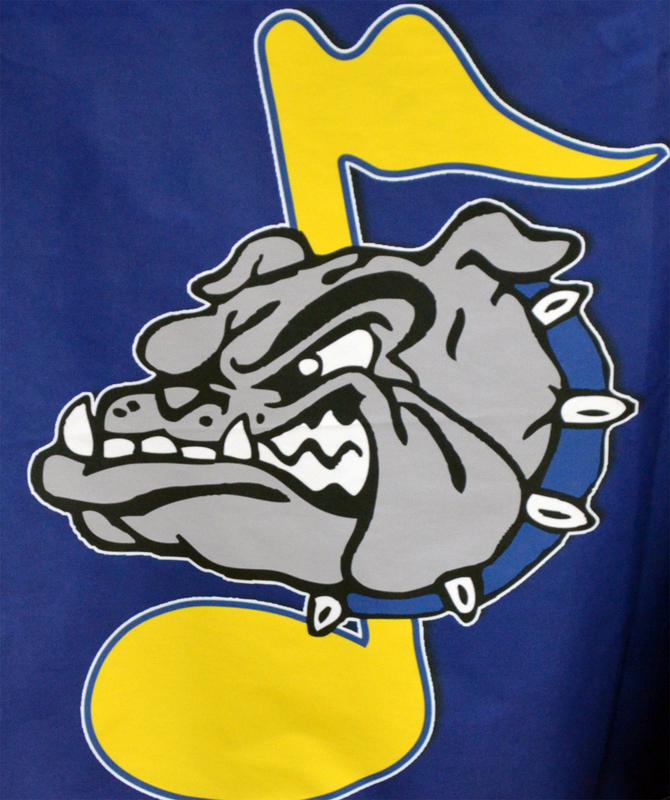 Make sure to wear tennis shoes and dress in Bulldog spirit wear or blue and gold. Enjoy an evening watching and supporting our talented students! Admission is $5 for adults, $3 for students, and free for children under age 3. Tickets are available at the door. Questions? Contact Sharon Knaggs (msknaggs92@sbcglobal.net or 440-463-8106). THIS TUESDAY, JANUARY 30TH @ 5:30 P.M.
Parents of students who will be 5 years old on or before August 1, 2018 and will be entering kindergarten this fall are encouraged to attend this important meeting to learn more about Olmsted Falls School District’s full day kindergarten program. Parents with children who miss the age cut-off of August 1 are also welcome to attend as the consideration process for early entrance will be reviewed. The OFHS Masquers and Forensics Patrons’ Cabaret Night is Thursday, February 1st in the OFHS auditorium. Doors open at 7 p.m. with the show starting at 7:30. It is general seating. Tickets cost $10. Don’t miss this great opportunity to enjoy our talented Masquers students in action! Looking for some sizzling entertainment on a cold, winter’s night? Come to the Bulldog Theatre Company’s Winter Monologue Showcase Friday, February 2nd, at 7:00pm in the OFMS Cafeteria. Enjoy free cookies, brownies, coffee and hot chocolate while 26 of our BTC company members present monologues they have prepared. This performance is free, so stop by and support live theatre in Olmsted Falls! *Performance begins at 7. Coffee service begins at 6:30. This year’s Olmsted Falls Middle School’s PTA Dodgeball Tournament is from 7-9 p.m. February 9th in the school’s gym. Registration for teams is now occurring in the double-elimination tournament with prizes awarded to the first- and second-place teams. The cost to enter is $30 per team with six members on a team. Uniforms are not necessary, but matching team colors are recommended. To download the registration form and complete rules, click HERE. 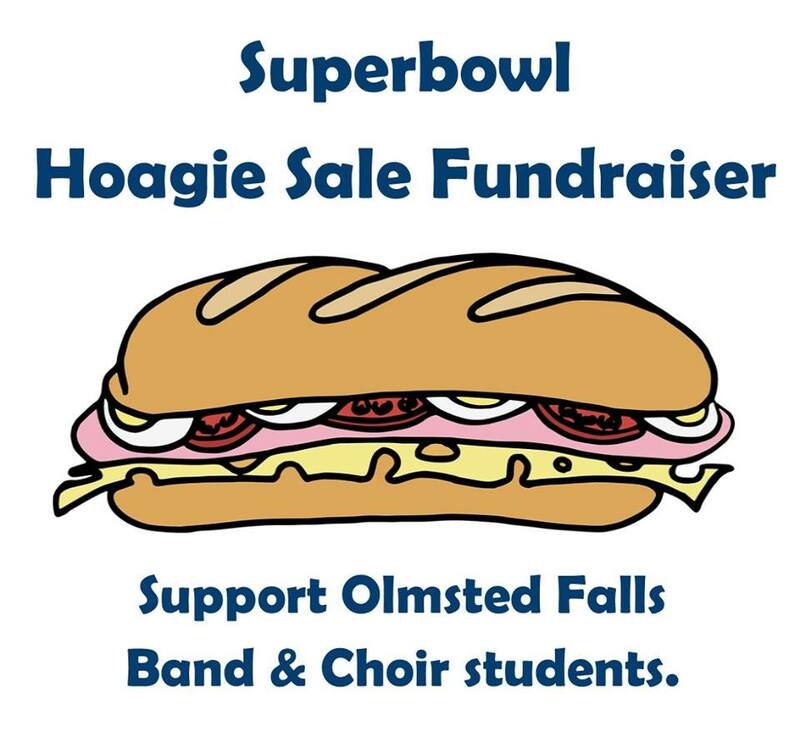 Hurry – the final day to order your Super Bowl Hoagie is today – Friday, January 26th! 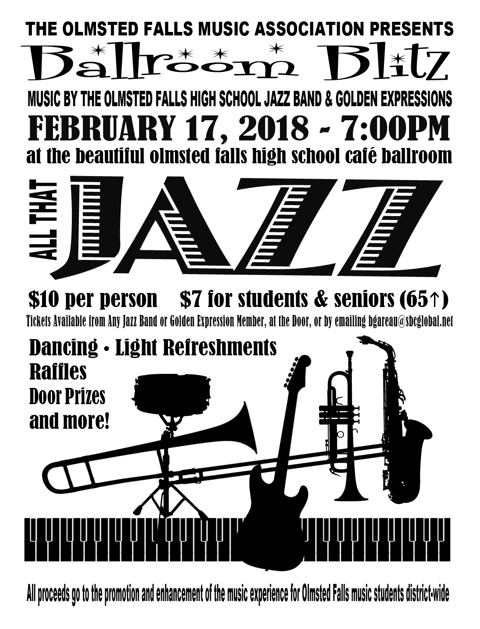 The Olmsted Falls Music Association offers this fundraiser annually. Orders should be given to any OFHS and grade 8 band and choir student or stop by Shaker’s IGA by noon on Saturday, February 3rd to buy yours – but they sell out fast! Hoagies are $5 each. For each sale, $2 goes to the students’ traveling account. Questions? Contact Janet Kollar, janetrk@sbcglobal.net. Due to popular demand, the fundraiser for ordering Helping Hands 3elove Clothing has reopened and will run through this Monday, January 29! To make your purchase of the “Bulldogs Celebrating Differences” design – or ANY other 3elove gear – use this link: https://www.3elove.com/pages/ ofcs-bulldogs or click HERE. OFCSDirect: Pay for shipping and handling and have your order shipped directly to your house. The Olmsted Falls High School PTA has a tasty fundraiser from 6:30 a.m. to 10 p.m. February 6th at the North Olmsted Chick-fil-A, 4779 Great North Boulevard. Mention OFHS PTA when placing your order and it will earn up to 25 percent of sales. You may dine in, carry out, drive through or cater for PTA to receive the benefits. Why not enjoy breakfast, lunch and/or dinner at North Olmsted’s Chick-fil-A that day. 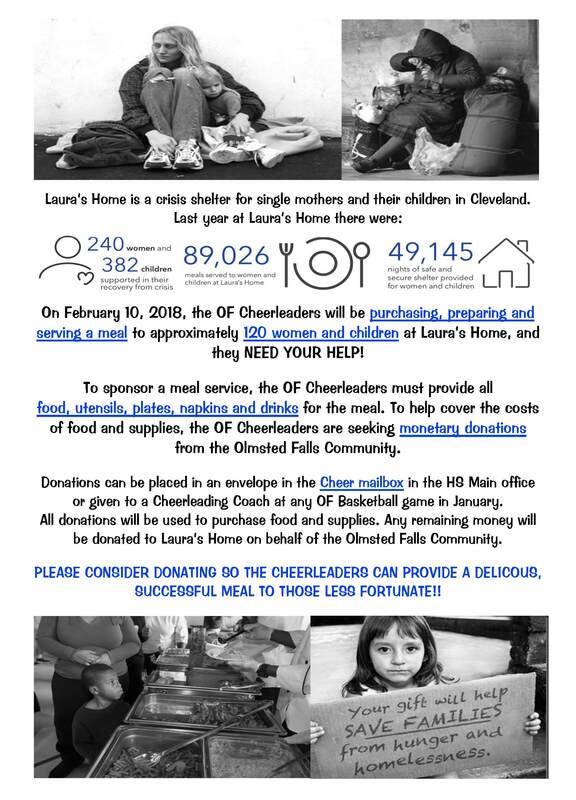 The OFHS cheerleaders on February 10th will prepare and serve a meal for about 120 women and children at Laura’s Home. They are seeking monetary donations. Donations also may be given directly to a cheerleading coach at any Olmsted Falls boys basketball game during the month of January. All donations will be used to purchase food and supplies. Any remaining dollars will be donated to Laura’s Home on behalf of the Olmsted Falls community. 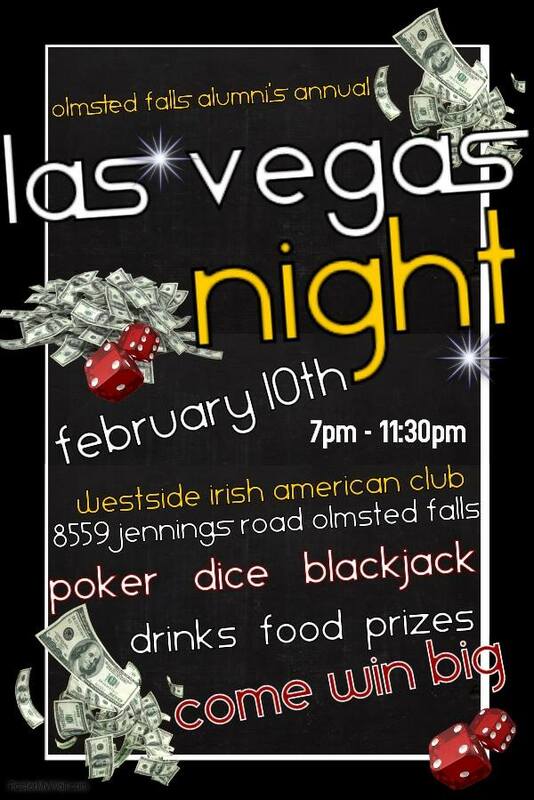 Mark your calendars for the February 10th annual Alumni Las Vegas Night at the Westside Irish American Club. 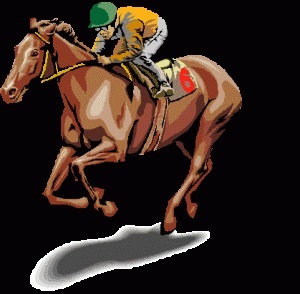 It runs from 7-11:30 p.m. at the club on Jennings Road. Attendees can win cash. 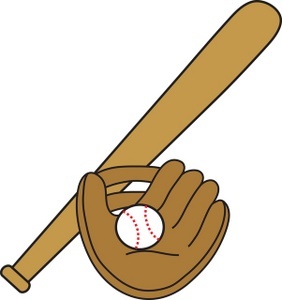 The Lorain County Hot Stove League is for players ages 6-17 who typically have a higher degree of talent than those participating in a community recreational league. The season begins around May 1 and ends mid July. The league extended its registration deadline until January 31st. It needs four more 8U players, at least three more 9U players and it does have some options for older players who want to sign up, too. To view a flyer, go to the Olmsted Community Center’s website by clicking HERE. Eight Olmsted Falls High School students were regional award winners in the Scholastic Art and Writing Competition. The students are listed below with their award and name of entry. Leah LaPinta: Honorable Mention, King of the Jungle. Congratulations to these students. To view a gallery of their entries, click HERE. All entries are available to view through February 3rd at the Cleveland Institute of Art, Reinberger Gallery, 11610 Euclid Ave., Cleveland. Gold Key honors represent the very best submitted work. They are automatically considered for national–level recognition in New York. Silver Key pieces are stand-out works that demonstrate exceptional ability. Honorable Mention artwork show great skill and potential. Thank you to the Cleveland Wheelchair Cavaliers for the awesome assemblies at Falls-Lenox Primary School yesterday! Thank you for being a fantastic part of our annual Celebrating Differences Week! Our Falls-Lenox Bulldogs always LOVE the day our friends from the Wheelchair Cavs are in the building! Our two teams of OFHS business students and their participation in the Veale Youth Entrepreneurship Forum’s “thinkBIG! Challenge” were featured this week on Cleveland.com. Kudos to Jeremy Shafer, Ben Pohlman and Ethan Short (Team pictured at left); and Maggie McCoy and Zach Wildenhaus (Team pictured at right). Best of luck to both teams as the they continue in this competition! Click HERE to read the full article by reporter John Benson. 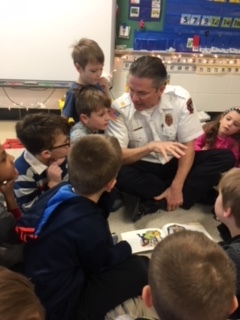 ECC students are getting special visits each Thursday as local Olmsted Township firefighters serve as guest readers in their preschool and kindergarten classrooms. Thank you Chief Kelly! To view a photo gallery of Fire Chief Kelly with the class, click HERE. Earlier this school year, OFCS Superintendent Dr. Jim Lloyd launched his own blog to provide information to the community about what’s happening in our schools, insights on decisions that are made, and important updates on what our district – and other local public school districts – are facing in the broader field of education. Earlier this week, Dr. Lloyd’s efforts and blog were featured in Cleveland.com as well as the weekly Sun Post-Herald. To read the story on Cleveland.com, please click HERE. To visit Dr. Lloyd’s blog, please click HERE. To follow Dr. Lloyd on Twitter, follow @OFCSSuper. 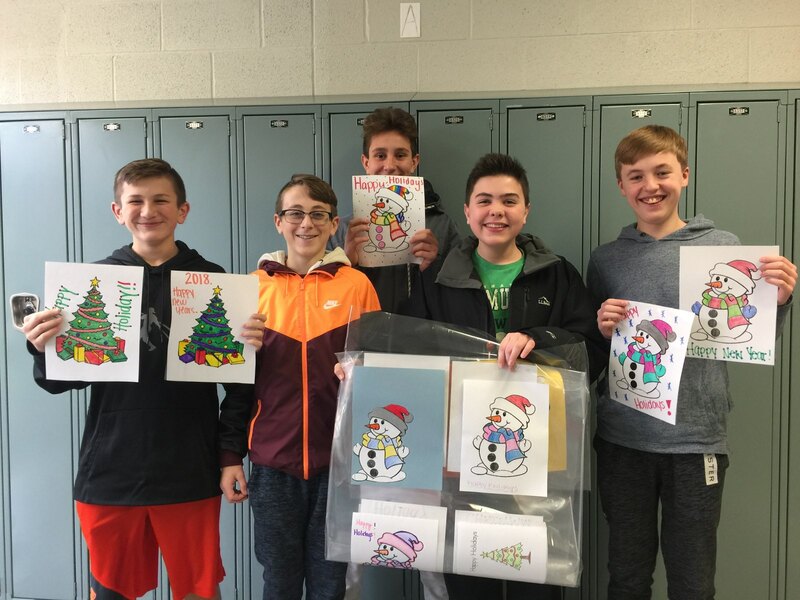 Over the recent holidays, Olmsted Falls Middle School eighth-grade students wrote special holiday cards and made decorations to send to neighboring senior citizens at the Villa Camillus Nursing Center and Riverview Pointe Care Center. Here are three programs for parents and students about their future college plans, whether while attending high school or after graduation. They are all on Wednesday, January 24th. PSAT Information Sessions: 4-5:30 p.m., OFHS Auditorium – A counselor will be available for parents to discuss PSAT scores and next steps for students in grades 9-11 who took the PSAT/9 and PSAT/NMSQT this past fall. 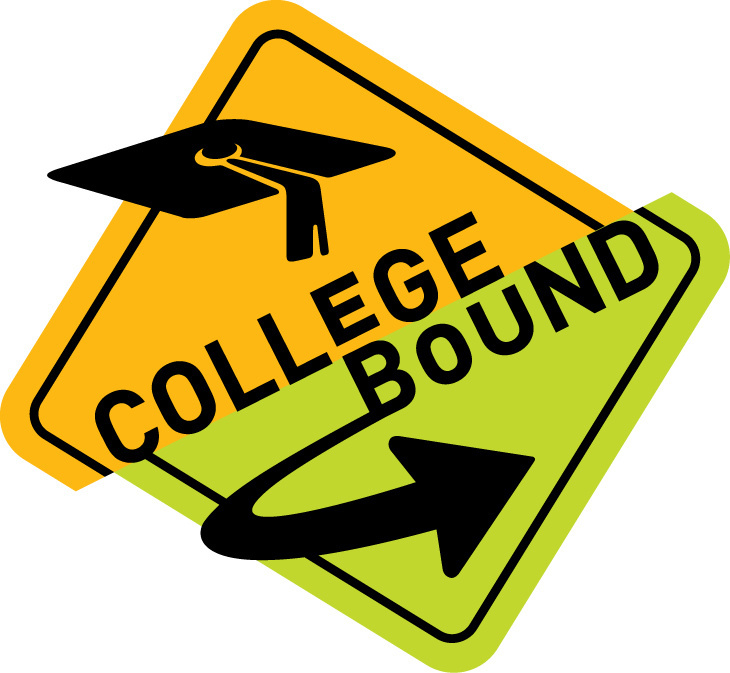 College Credit Plus Information Session (CCP): 6-7 p.m. OFHS Auditorium – There will be a College Credit Plus (CCP) Information session for parents and students currently in grades 6-11. CCP is a program that allows students to take college courses earning both college and high school credit simultaneously. The information session will outline program eligibility, admissions and scheduling. Representatives from area colleges will also be available to answer your questions. Junior Parent College Night: 7-8 p.m. OFHS Auditorium – Parents of junior students planning to attend either a 2- or 4-year college/university should attend this meeting. A counselor will introduce college exploration resources and discuss the college admissions process. We will also have a guest speaker. Professor William Leamon from Notre Dame College will be presenting: College Success 101: Tips from a College Professor. CONGRATS TO EAGLE SCOUT NATE SAMSEL! Congratulations to OFHS senior Nate Samsel on earning the rank of Eagle Scout! Nate is a member of Troop #228. For his Eagle Scout Eagle Leadership project, Nate restored a wrought iron fence surrounding the Fowles Family Cemetery located in Middleburg Heights. Nate’s service to the community is very much appreciated. Congratulations again! OFCS Technology Integration Specialists Dawn Carlin and Jeff VanArnhem made a presentation at for parents at the OFMS PTA meeting held January 9th. The topic of the presentation was “Emerging Technologies for Middle School Students.” The presentation which covered what the emerging technologies are at this time and discussed some tips for parents was very well received. The presentation contained some very helpful links to resources for parents. Those in attendance felt the information was valuable and requested it be made available online so they as well as other parents who were not able to attend the meeting could have access to the information. To view the “Emerging Technologies for Middle School Students” presentation, please click HERE. We are always pleased to share such technology resources with parents and hope many find the information valuable. Thank you to Mrs. Carlin and Mr. VanArnhem for their time and expertise! One more helpful FYI for all parents that our technology team just came across…. Olmsted Falls Middle School dads, grandpas and any important guy in your children’s lives are invited to spend some quality time at school with them. This PTA “members only” event, which is a benefit of joining PTA, is set for 7:30-8:30 a.m. Friday, February 2nd in the OFMS cafetorium. Remember to bring your camera for a great photo op! Hurry, deadline to RSVP is January 24th by completing the form by clicking HERE. Not sure if you’re a PTA member? Email lindsay0718@yahoo.com to check on your membership status. The Olmsted Falls High School PTA’s 31st annual talent show will take place in the Olmsted Falls High School Auditorium on Saturday, January 27th at 7 pm. This scholarship fundraiser will feature approximately 25 local students in grades K-12 performing a myriad of talents including: singing, dancing, and playing various instruments. New this year, we will have a number featuring the entire cast! Also new this year, members of the Golden Bullettes Drill Team will teach a dance number to preschoolers before the show starting at 6pm, and they will preform at the beginning of the second act. If you are interested in the preschool program, please see Dance With the Golden Bullettes at the OFHS PTA Talent Show for details. Make sure to wear tennis shoes and dress in Bulldog spirit wear or blue and gold. Enjoy an evening watching and supporting our talented students! Admission is $5 for adults, $3 for students, and free for children under age 3. Tickets are available at the door and in the OFHS auditorium on Monday, January 22nd from 6-9 pm. Questions? Contact Sharon Knaggs (msknaggs92@sbcglobal.net or 440-463-8106). IMPORTANT NOTE TO TALENT SHOW PERFORMERS: REHEARSAL DATE/TIME HAS CHANGED! Rehearsals for the Talent Show have been moved from Tuesday, January 23rd to Monday, January 22nd. (There will be no longer be rehearsals on Tues., Jan. 23rd.) Rehearsals are now scheduled to take place on MONDAY, JANUARY 22ND beginning at 5:00 p.m. The OFHS Masquers and Forensics Patrons’ Cabaret Night is ready for action on February 1st in the OFHS auditorium. 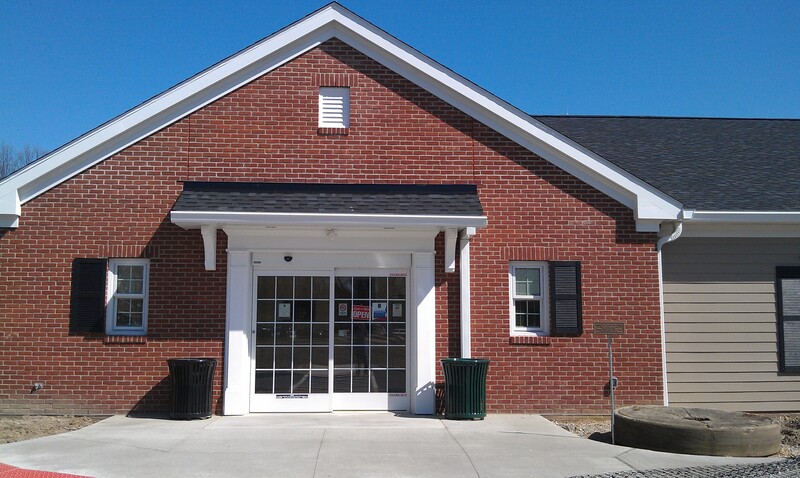 WHERE: Olmsted Falls branch library’s meeting room A and B. Registration required. Details available by clicking HERE. Olmsted Falls schools will be closed this Monday, January 15th, for Martin Luther King Day. Classes will resume Tuesday, January 16th. Have a safe extended weekend! Local media highlighted Falls-Lenox School’s innovative WIN Block program that was launched this school year. Congratulations to our teachers and students! 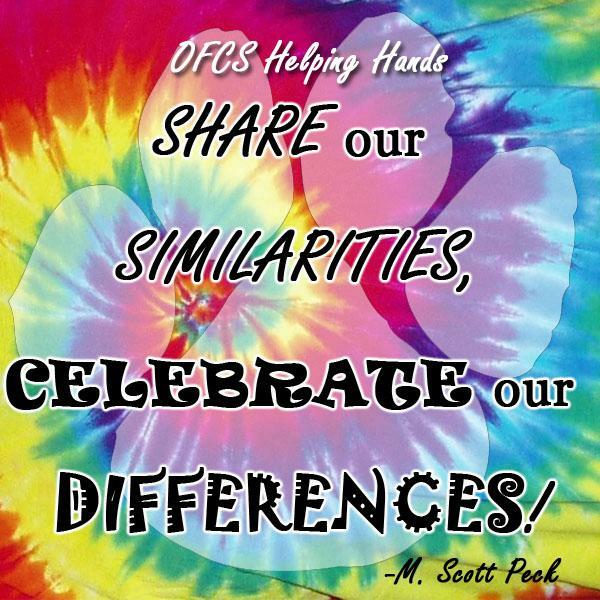 This coming Tuesday through next Friday – January 16th – 19th – is the annual OFCS Celebrating Differences Week. Remember, school is out on Monday. The entire district will participate in many ways, including the following. Tuesday, January 16th: BLUE to support Downs Syndrome, autism and anti-bullying. Wednesday, January 17th: RED/MAROON/PURPLE to support Rett Syndrome, ADHD, rare or misdiagnosed diseases and anti-gay bullying. Thursday, January 18th: TEAL/GREEN to support anxiety disorder, mental health disorder and Cerebral Palsy. Friday, January 19th: Tie-Dye/Bulldog Wear/3elove to support ALL Bulldogs who are different!! Each building will sell $1 stickers to support CDW (please see the images with this post). Proceeds will benefit future Helping Hands events. ECC: In the art room until 8:10 a.m.
Falls-Lenox: In the lobby from 7:35- 8:10 a.m.
Intermediate School: In the cafeteria during lunches. Middle School: In the Media Center from 8:20-8:35 a.m. and in Room 14 during STAR. High School: At the Bulldog Spirit Shop. Additional activities are also planned for the week. Visit the HH Calendar on the Helping Hands website by clicking HERE to see what else is planned at your building. Did You Know? Our school board members also donate back a significant portion of their meeting stipends to the Local Scholarship Fund to benefit OFHS graduates each year. The Olmsted Falls Board of Education held its annual organization meeting on Wednesday, January 10th in the OFMS Media Center. Board members (pictured L to R) Holly Neumann, Joe Bertrand, Linda Parkowski and Cynthia Tomasch were officially sworn in by Treasurer Ms. Emily Dales to serve new four-year terms, following their re-election to office in the recent November 2017 election. Congratulations! During the organizational meeting, Mr. Joe Bertrand was elected to serve as Board President for the calendar year 2018. Mrs. Holly Neumann was elected to serve as Board Vice President for this calendar year. Both Mr. Bertrand and Mrs. Neumann were formally sworn into their respective positions by Ms. Dales. Board member Mrs. Cynthia Tomasch will serve as the Board’s legislative liaison for 2018, helping the group to monitor the constantly changing landscape of educational policy coming out of both Columbus & Washington, D.C.
We extend both congratulations and thanks to these individuals for taking on these additional responsibilities in the coming year, and thank all five Board members for their ongoing dedication and commitment to the students and staff of Olmsted Falls City Schools. 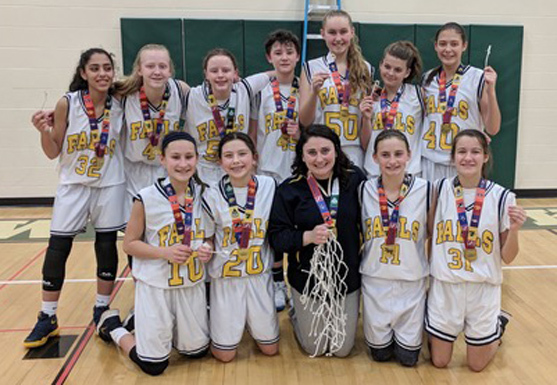 Congratulations to the Olmsted Falls Middle School girls basketball team! The players won the Southwest Conference championship January 11th. Berea Elks Lodge collected an overwhelming total of 946 essays from Berea, Olmsted Falls & Strongsville School Districts. This was more than double the number of essays they’ve ever received before! These winning students from Olmsted Falls Middle School offered some extremely interesting ideas on this year’s theme, “Why Our Veterans are America’s Heroes”! These essays – along with the top three winners from the 5th/6th grade division – will be sent to the Elks NE Ohio District, winners there move on to State & National competitions. All winning students, their families, teacher and administrators will be invited to attend the lodge’s annual Youth Appreciation Dinner in May. Congratulations to Bulldogs Elise, Kelly and Lilly! Best of luck as your essays continue on in this year’s Elks Americanism Essay competition! The 31st Annual Olmsted Falls High School PTA Talent Show will be held Saturday, January 27, 2018 at 7 pm in the Olmsted Falls High School Auditorium. Join us for a fun filled evening featuring acts ranging in age from Kindergarten through 12th Grade demonstrating their musical, instrumental, vocal, dance and acrobatic talents. Please come and support these amazing students. Tickets $5 Adults, $3 Students. All proceeds will benefit the OFHS scholarship fund benefiting graduating Seniors of the Class of 2018. For information please contact Mrs. Knaggs, 440-463-8106, or msknaggs92@sbcglobal.net or Mrs. Ferrini at 440-427-0894 or claudiaferrini@sbcglobal.net. with questions. The OFHS cheerleaders will host a mini cheer night for Bulldog students in grades 2-5 at the January 26th boys varsity high school basketball game. They will perform during half-time at the OF-Westlake contest. A clinic, which the cheerleaders will conduct, the night before the game from 6:30-8:30 p.m. January 25th in the OFIS cafeteria, is required for those cheering at the basketball game during half-time. Each participant will receive a free T-shirt, admission to the game, a snack at the game and a picture with the Bulldog and varsity cheerleaders. The cost is $25 for the first child then $20 for each additional child in the same immediate family. To view the flyer, click HERE. For questions, please contact ofhscheerleading@gmail.com. 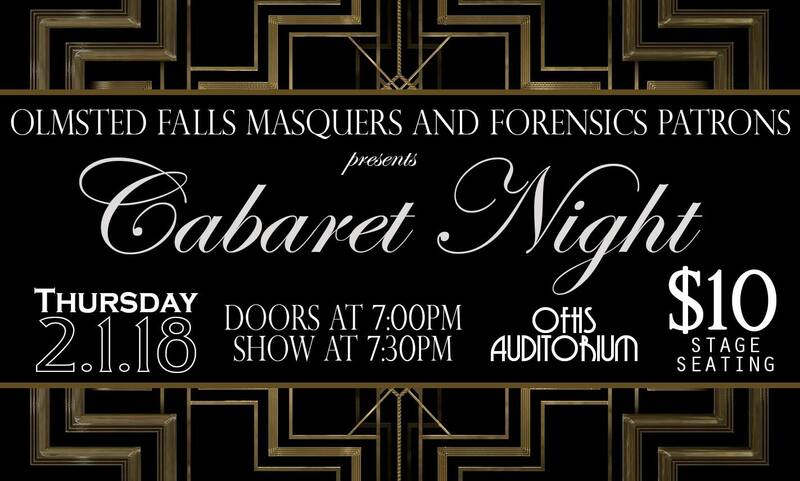 The OFHS Masquers and Forensics Patrons’ Cabaret Night is now set for February 1st in the OFHS auditorium. Congratulations to Jeremy Shafer and Kyle Lewis of Boy Scout Troop 228 in Berea. 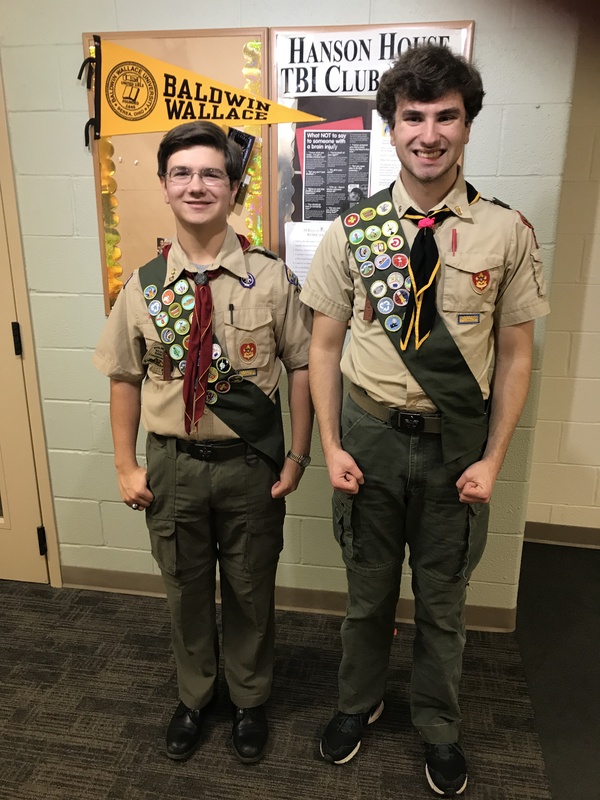 The two Bulldog seniors are the troop’s latest scouts to reach the Eagle rank. They have been involved in scouting since the first grade. Jeremy’s project included planning and building a viewing platform for wildlife in the Sandy Ridge Reservation, which is part of the Lorain County Metroparks. He plans to attend Franciscan University in Steubenville to study marketing. Kyle’s project involved planning and constructing a sand/water table that teachers may use in the Olmsted Falls Middle School science department. He plans to attend Bowling Green State University to study computer science. The Eagle Scout is the highest achievement attainable in the Boy scouting program. Only 4 percent of scouts obtain this rank. Again, congratulations, Kyle and Jeremy. All Olmsted Falls City School District buildings will be CLOSED ON THURSDAY, JANUARY 4TH AND FRIDAY, JANUARY 5TH due to weather conditions.